Before the heroes of both Gotham and Metropolis do battle on the big screen this March in Batman v Superman: Dawn of Justice, these icons will be featured on new cans of Dr. Pepper soda. Batman (Ben Affleck) will be featured on regular Dr. Pepper cans, while Superman will be featured on Diet Dr. Pepper. This promotion will also feature Wonder Woman (Gal Gadot) on Dr. Pepper Cherry cans, with Jesse Eisenberg on Diet Dr. Pepper and Amy Adams (Lois Lane) on Dr. Pepper Ten cans. Fans will also be able to get $5 towards a Batman v Superman: Dawn of Justice movie ticket when you buy three Dr Pepper 12-packs (or three 8-packs of 12 oz. bottles). This highly-anticipated superhero adventure will mark the first time both Batman (Ben Affleck) and Superman (Henry Cavill) have been seen on the big screen together in cinematic history. The movie will also introduce Gal Gadot as Wonder Woman, whose stand alone movie is currently in production and set to hit theaters on June 23, 2017. It has also been rumored that this movie will introduce the rest of the Justice League, before Justice League Part 1 and Justice League Part 2 hits theaters in 2017 and 2019, respectively. We reported last week that box office analysts are predicting Batman v Superman: Dawn of Justice could take in $154 million in its opening weekend. As impressive as those numbers are, especially for a March opening, this projected figure still pales in comparison to the current opening weekend record, $247.9 million. Still, if Batman v Superman: Dawn of Justice hits this mark, it could set the stage for big things to come from the DC Extended Universe (DCEU). Batman v Superman: Dawn of Justice stars Oscar winner Ben Affleck (Argo) as Batman/Bruce Wayne and Henry Cavill as Superman/Clark Kent in the characters' first big-screen pairing. The film also stars Oscar nominees Amy Adams (American Hustle) as Lois Lane, Jesse Eisenberg (The Social Network) as Lex Luthor, Diane Lane (Unfaithful) as Martha Kent, and Laurence Fishburne (What's Love Got to Do with It) as Perry White; Oscar winners Jeremy Irons (Reversal of Fortune) as Alfred, and Holly Hunter (The Piano) as Senator Finch; and Gal Gadot as Wonder Woman/Diana Prince. Zack Snyder directed from a screenplay written by Chris Terrio and David S. Goyer, based on characters from DC Comics, including Batman, created by Bob Kane with Bill Finger, and Superman, created by Jerry Siegel and Joe Shuster. The film is produced by Charles Roven and Deborah Snyder, with Wesley Coller, Geoff Johns and David S. Goyer serving as executive producers. Batman v Superman: Dawn of Justice launches Warner Bros. new DC Comics slate of movies, including Suicide Squad (August 5, 2016), Wonder Woman (June 23, 2017), Justice League Part 1 (November 17, 2017), The Flash (March 23, 2018), Aquaman (July 27, 2018), Shazam! (April 5, 2019), Justice League Part 2 (June 14, 2019), Cyborg (April 3, 2020) and Green Lantern Corps. (June 19, 2020). We'll have to wait and see how these other adventures fare at the box office, but they are all shaping up to be big hits as well. 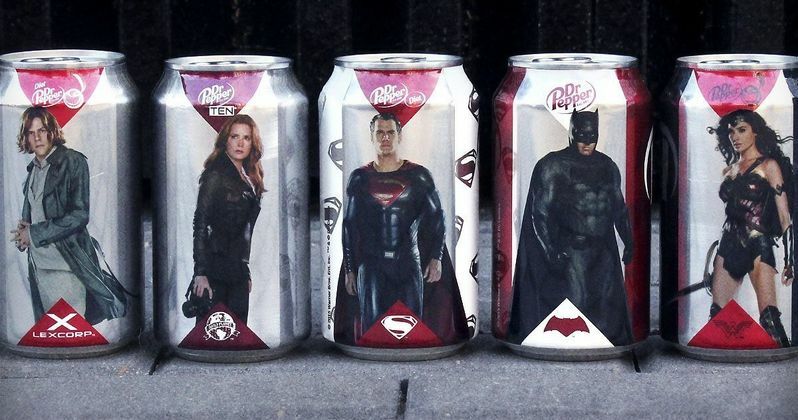 Take a look at these Dr. Pepper cans for Batman v Superman: Dawn of Justice, and stay tuned for more on this adventure.